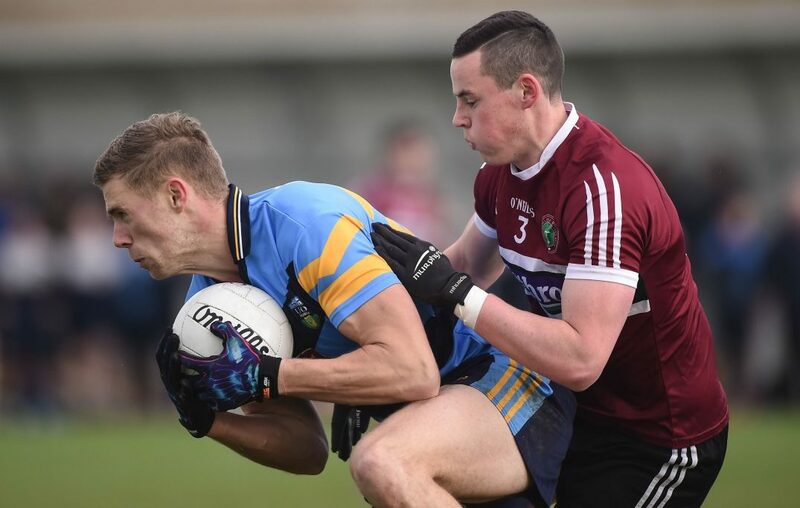 St.Mary’s have qualified for the last four of the Sigerson Cup battling in earnest to a two point win over Maynooth in Dundalk. Once again, Shane McGuigan led the scoring charge for the ‘Ranch’ while Armagh midfielder, Jarlath Og Burns controlled the middle sector, covering every blade of grass along the way. Late scores from McGuigan and wing-back, Colm Byrne secured the victory for the Belfast men as their defence held firm against an aerial barrage in injury time. Maynooth held a slender one point advantage at the break after a nip and tuck battle with Stephen McConville and Padraig Fogarty trading scores. In the second half, it appeared that Gavin McGilly’s men had the greater scoring options and turned the screw racing into a four point lead midway through the half as Niall Toner, McGuigan and Ryan Coleman landed scores. With the clock ticking towards full time, Padraig Fogarty landed a monstrous forty-five before Stephen O’Hanlon clipped over from a narrow angle to put two between them. Fogarty was deployed to the edge of the square as his side went in search of a major to save their season. These efforts were in vein as Liam Rafferty claimed the breaking ball to confirm the win as both sides were reduced to 14 as Daniel McKinless and James Kelly saw red for off the ball incidents. The Ranch will now meet DCU in the semi-final next Saturday evening in Mallow, Cork. St.Mary’s: M Reid, L Rafferty (0-1), C Dillon, M Rooney, C Byrne (0-2), R McCusker, A Duffy, L Devlin (0-1), J Óg Burns (0-1), S McConville (0-3 1f), S McGuigan (0-5 3f), A Boylan, N Toner (0-1), R Coleman (0-1), C McKinney. Subs: R McSherry for C McKinney (42), D McKinless for M Rooney (50). Maynooth: N Currie, N O’Sullivan, J Kelly, M Hyland, D Courtney, J Gibbons (0-1), E Maloney, E Devine, D Lyons, R O’Giollain, N O’Donnell, S Comford, S O’Hanlon (0-3), P Fogarty (0-6 4f), J Hyland (0-2 2f).